Marshall Kirkpatrick has a great post over at Read/Write Web about keeping momentum. In that post, he describes one technique - make yourself a public case study. So, in that spirit, I'm sharing my presentation from last week which is a case study of my blogging ROI. My main point is that you just think of ROI as math, then you're missing the a lot of the value of doing an ROI analysis. I had the honor of presenting on a panel at the eMetrics Conference with Jonathon Coleman, Nature Conservancy and Laura Lee Dooley. World Resources Institute - two of the most savvy and smart nonprofit social media practitioners who are also metrics geeks. What a combination! 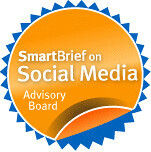 I also wanted to blog both Laura's excellent Twitter Digg deck and Jon's concise and smart case study of Digg. They follow below. In addition, WebMetrics Guru and Search Marketing Gurus took awesome notes! A bonus is Laura's Twitter links in Del.icio.us. If you want follow web metrics bloggers, check out this list form All Top. Laura has also compiled a list of live blog posts done at the emetrics conference - a very valuable resource. So good to finally meet you in person and watch you present! You have an amazing capacity for energy and such a strong ability to make sense of these complex issues of marketing, branding, identity, and community. Something that I'm curious about for wider discussion in our community -- how do the best practices and skills that we've all learned in using social media and online word-of-mouth-marketing to support our causes translate over to either the government or for-profit sectors? We had a lot of attendees at this session from both corporations and government agencies. What do they see, what do they think when us nptechies describe the importance of community-building? I'm not at all convinced that our strategies will work for them. I am interested in if there are Twitter tools that help you to search based on interest AND location. I just began doing social media for Blood Centers of the Pacific. We began a Twitter hoping to use it to spread information about when events are going on, where blood drives will be, information about donating blood, etc. However, we are really only interested in connecting with people in the Bay Area, since those are going to be our potential donors. Any good recs of a search tool that might be helpful? "Twitter tools that help you to search based on interest" There is actually. Really great clarification on how organizations need to look at social media ROI. Social media ROI is certainly not linear but having metrics like, for one, ramping up public awareness and loyalty, makes it a lot easier to continue mapping out what success looks like. There are a lot of tools already in place I use to help measure a "return on engagement". You've got a wonderfully simple way of expressing sometimes complicated topics...I've really enjoyed going through your blog these past few days. I'm excited about using some of the things I'm picking up here in my upcoming projects. Thanks for connecting!